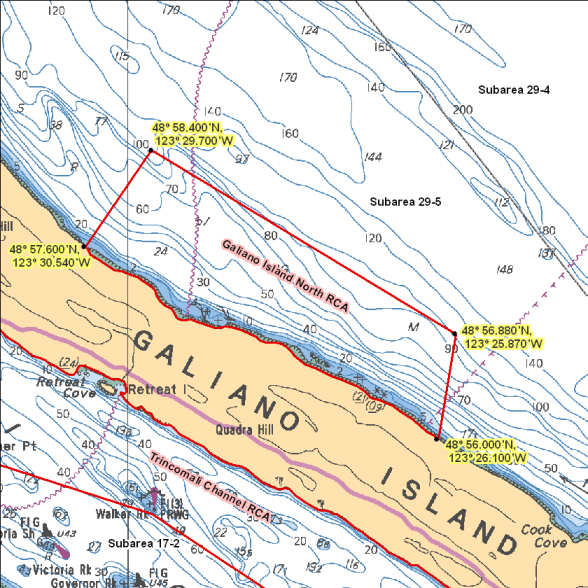 Area 29: Download a printable PDF version of this map. In streams and rivers, tidal waters and non-tidal waters meet. In Area 29 these boundaries are marked by bridges and rail lines. On the side closest to the ocean, the waters are considered tidal. On the side farthest from the ocean, the waters are considered non-tidal. 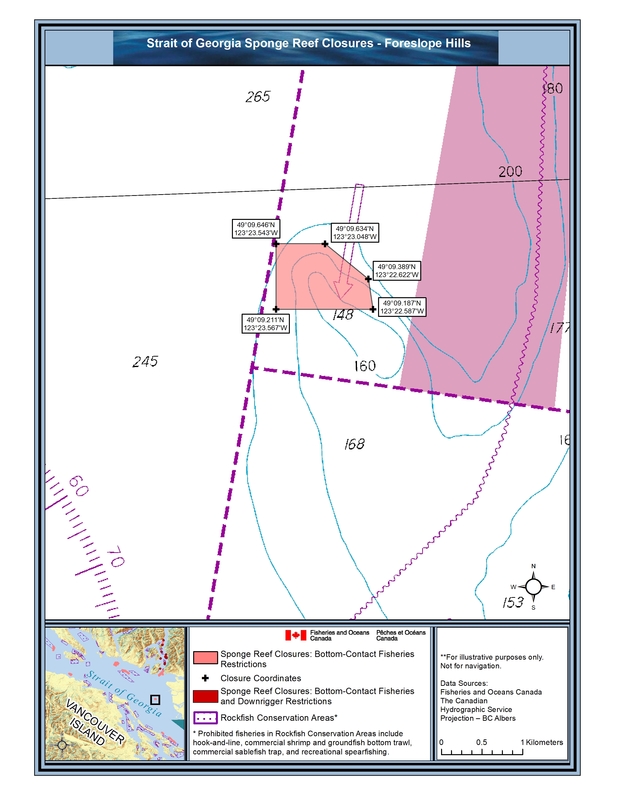 See Region 2 (Lower Mainland) for salmon fishing opportunities on the freshwater (non-tidal) side of these boundaries. Finfish 29-11 to 29-17 Reminder Fishing for all fin fish including salmon in the tidal waters of the Fraser River is permitted during daylight hours only. 29-1 to 29-10 Gear Restriction Single and treble barbless hooks acceptable. 29-11 to 29-17 Gear Restriction It is prohibited to use more than one line when sport fishing in the tidal waters of the Fraser River. 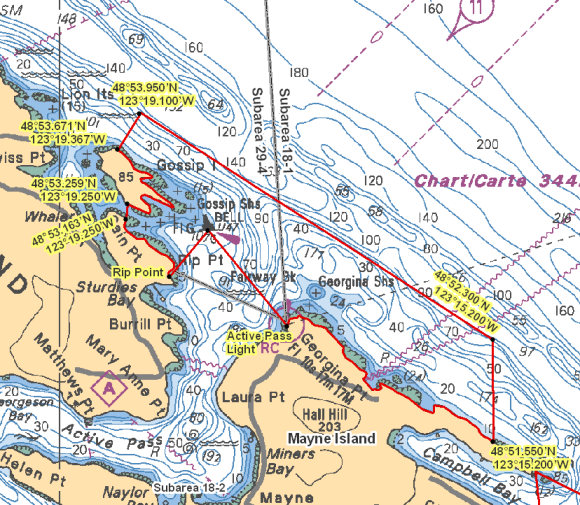 Crab 29 Reminder Combined daily limit for Dungeness crab, red rock crab, box crab, Puget Sound king crab and all other king crab is 4. 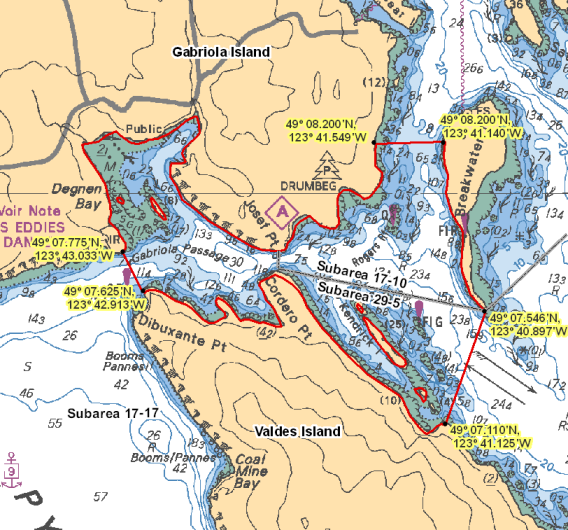 29-1 to 29-3 Dioxin Contamination (g/w) Consumption of crab hepatopancreas should not exceed 130g/week - consumption of crab hepatopancreas harvested in Howe Sound and the Strait of Georgia in subareas 28-2 and 29-1 and portions of subareas 28-1, 29-2 and 29-3, in the waters bounded: on the north by a line from Brunswick Point west to Irby Point on Anvil Island and along the shoreline to Domett Point on Anvil Island, west to McNab Point on the mainland, on the west by a line from McNab Point to Ekins Point on Gambier Island that follows the eastern and southern shoreline to the government wharf at Gambier Harbour, then proceeds south to Cotton Point on Keats Island and along the eastern and southern shoreline, south to Home Island and continues from southern tip of Home Island west to Gower Point, then follows the shoreline north and west to Reception Point, then on the south by a line that goes from Reception Point east to a point 1.5 km true south of Cape Roger Curtis on Bowen Island, and finally east to Point Atkinson, should not exceed 130 g/week. 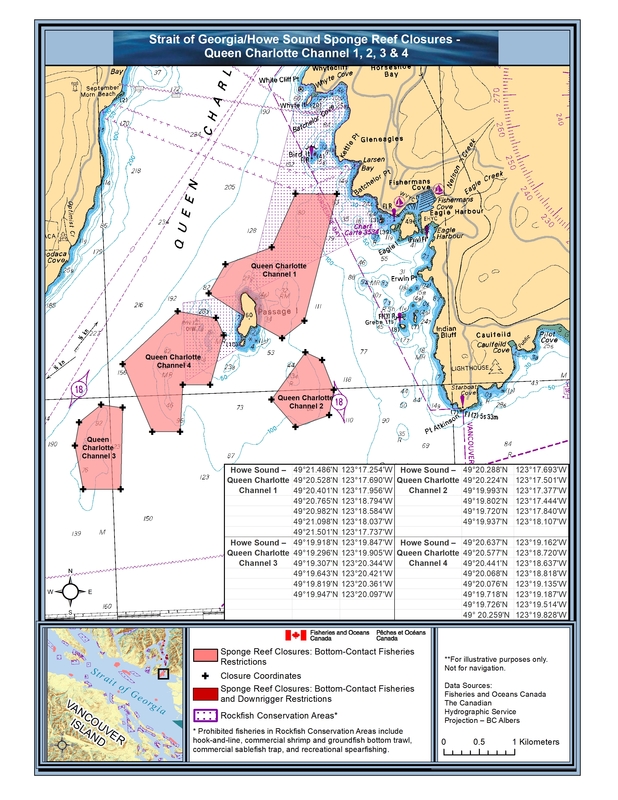 Herring 29 Reminder Harvesting of herring roe from marine plants or plants placed in the water for the purpose of harvesting herring roe is prohibited. 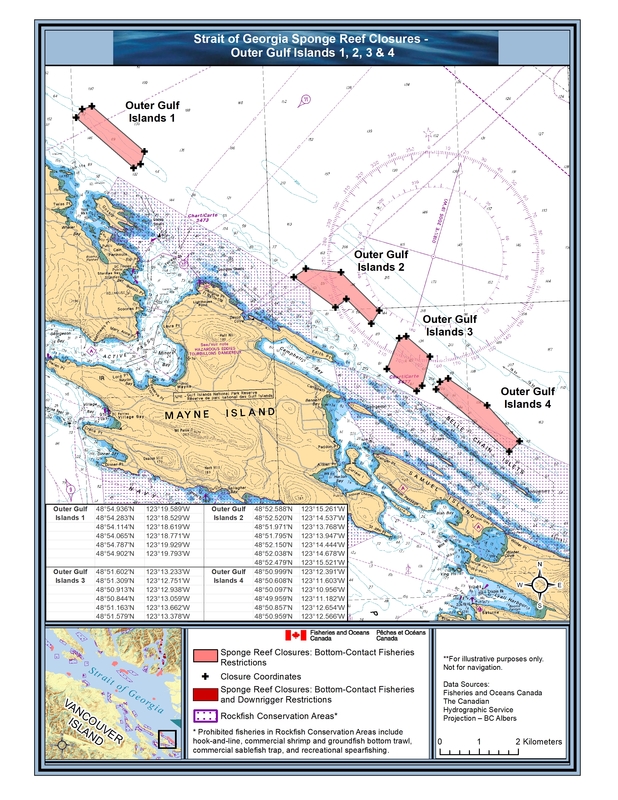 Codfish 29 Reminder Species includes: Pacific cod, Pacific tomcod, pollock and hake but does not include lingcod. Tsawwassen Ferry Terminal and Delta Port Tsawwassen_Ferry_Terminal_and_Delta_Port.pdf The waters inside a line drawn from a point on land at 49°01.567'N and 123°08.787'W to the TB Yellow Marker at 49°01.464'N and 123°08.633'W, thence to the T8 Red Marker at 49°01.214'N and 123°08.578'W, then to the T6 Red Marker at 49°00.887'N and 123°08.644'W, thence to the T4 Red Marker at 49°00.696'N and 123°08.922'W, thence to the T2 Red Marker at 49°00.489'N and 123°09.201'W, then southeasterly to the BC Ferry Western docking pylon at 49°00.323'N and 123°08.189'W, thence following the BC Ferry property coastline to 49°00.470'N and 123°07.582'W, thence southeasterly to the most northeasterly point of the Tsawwassen Breakwater at 49°00.230'N and 123°07.440'W, thence to the southwesterly point of the Tsawwassen Breakwater at 49°00.134'N and 123°07.725'W, thence westerly to a point in water at 49°00.133'N and 123°11.270'W, thence due north to a point in water at 49°00.913'N and 123°11.270'W, thence due east to the west end of the Delta Port Dock at 49°00.666'N and 123°10.082'W, thence northeasterly following the Delta Port causeway to 49°00.822'N and 123°09.533'W, thence following the Delta Port property coastline to the point of commencement. Foreslope Hills Foreslope_Hills.jpeg That portion of Subarea 29-3 that lies inside a line that: begins at 49°09.634'N 123°23.048'W then southeasterly to 49°09.389'N 123°22.622'W then to 49°09.187'N 123°22.587'W then to 49°09.211'N 123°23.567'W then to 49°09.646'N 123°23.543'W then to the beginning point. 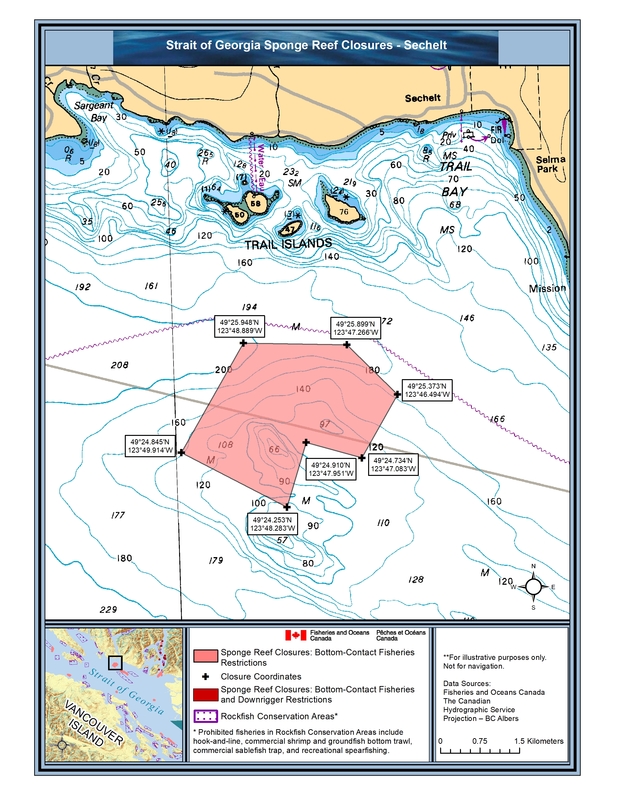 Gabriola Passage Gabriola_Passage.png Those waters of Subareas 17-10, 17-17 and 29-5 that lie inside a line that: begins at 49°08.200'N 123°41.549'W Gabriola Island then true east to 49°08.200'N 123°41.140'W Breakwater Island then southerly following the westerly shoreline of Breakwater Island to 49°07.546'N 123°40.897'W Breakwater Island then to 49°07.110'N 123°41.125'W Valdes Island then northerly following the shoreline of Valdes Island to 49°07.625'N 123°42.913'W Dibuxante Point then to 49°07.775'N 123°43.033'W Gabriola Island then easterly following the shoreline to the beginning point. 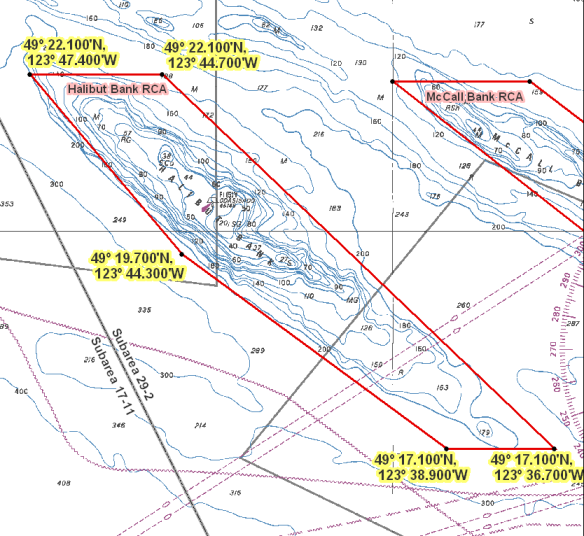 Halibut Bank Halibut_Bank.png That portion of Subarea 29-2 that lie inside a line that: begins at 49°21.768'N 123°41.501'W then southerly to 49°21.174'N 123°40.045'W then to 49°20.961'N 123°40.139'W then to 49°20.803'N 123°39.860'W then to 49°20.565'N 123°40.182'W then to 49°21.610'N 123°41.843'W then to 49°21.673'N 123°42.643'W then to 49°21.895'N 123°43.908'W then to 49°22.174'N 123°44.748'W then to 49°22.555'N 123°44.456'W then to 49°22.188'N 123°42.167'W then to the beginning point. 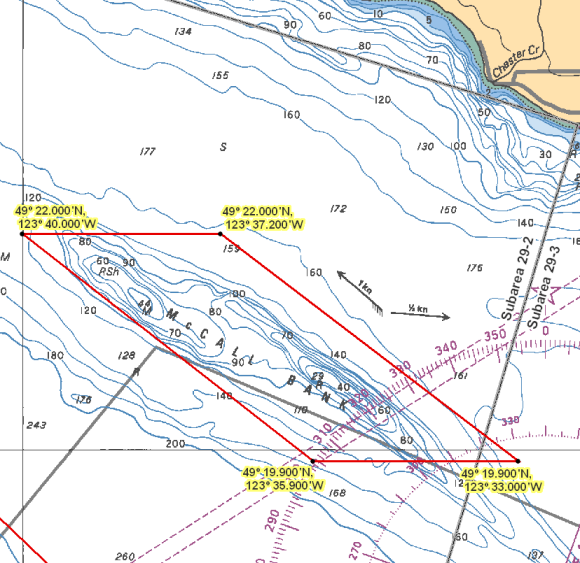 McCall Bank McCall_Bank.png That portion of Subareas 29-2 and 29-3 that lies inside a line that: begins at 49°22.000'N 123°40.000'W in water then to 49°22.000'N 123°37.200'W in water then to 49°19.900'N 123°33.000'W in water then to 49°19.900'N 123°35.900'W in water then to the beginning point. Sechelt Sechelt.jpeg That portion of Subarea 29-2 that lie inside a line that: begins at 49°25.948'N 123°48.889'W then easterly to 49°25.899'N 123°47.266'W then to 49°25.373'N 123°46.494'W then to 49°24.734'N 123°47.083'W then to 49°24.910'N 123°47.951'W then to 49°24.253'N 123°48.283'W then to 49°24.845'N 123°49.914'W then to the beginning point. 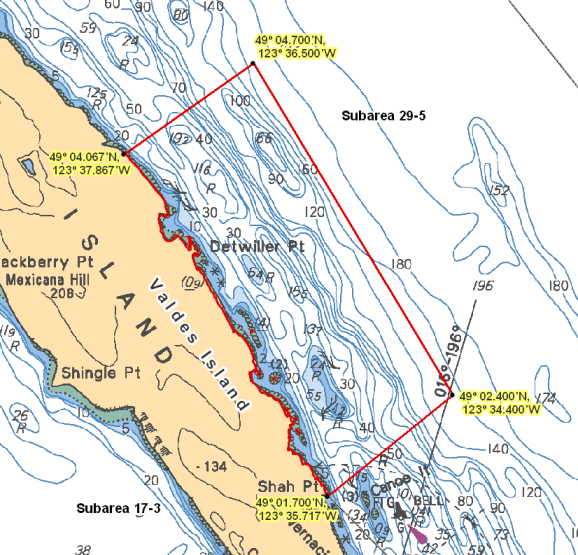 Valdes Island East Valdes_Island_East.png That portion of Subarea 29-5 that lies inside a line that: begins at 49°04.067'N 123°37.867'W Valdes Island then to 49°04.700'N 123°36.500'W in water then to 49°02.400'N 123°34.400'W in water then to 49°01.700'N 123°35.717'W Shah Point then northerly following the shoreline to the beginning point.